Written by Janet Choi on February 16, 2017 . Retention. It’s all about saving customers who are about to churn, right? Nope. Retention efforts start way at the beginning. From signup and onwards, healthy user retention involves proactive work—on product, marketing, analytics, and support. Email is one vital tool to channel those efforts to customers, and drive the user experience. 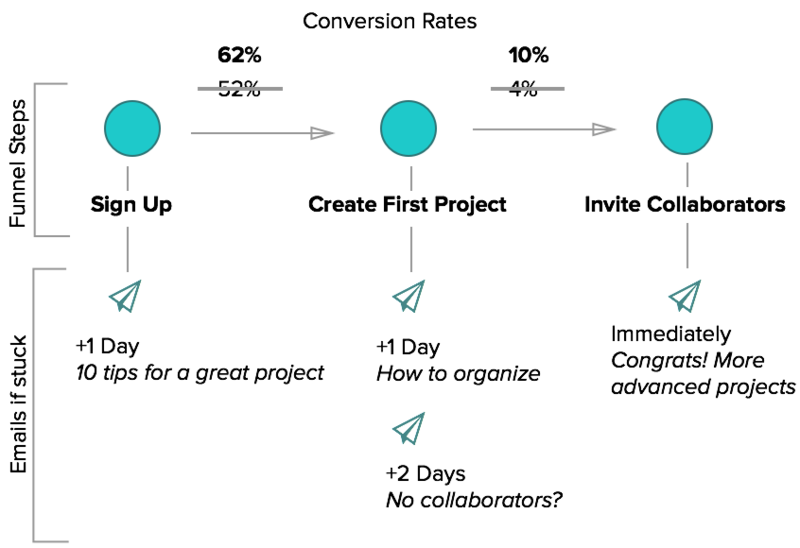 Let’s look at some email strategies across the first 3 months of the customer lifecycle that you can wield in your ongoing quest to keep people coming back to your product. click to see full email Great welcome email experiences help guide new users back after the first interaction. Too often, this is the stage where things fall apart. Whether users are active or inactive, it’s a crucial time to prove your value and cement your relationship. 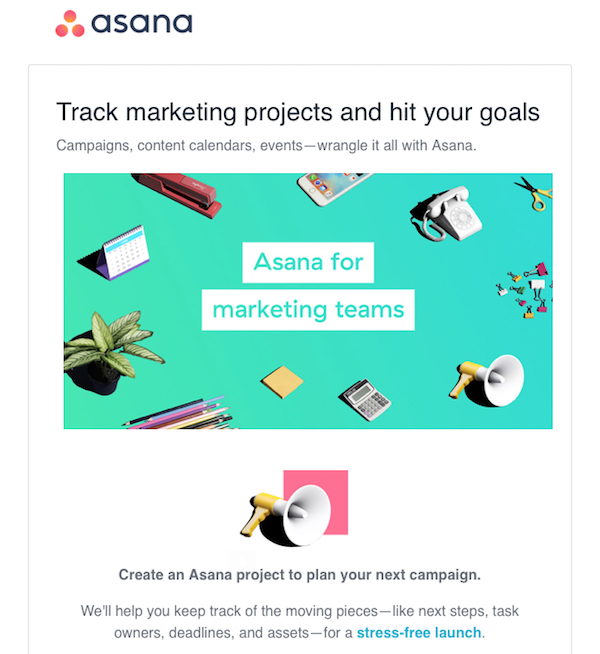 Triggered emails provide handy bridges to meaningful action in your product for users who are stuck or could use a boost. Nudge people closer to the Aha! moments that impact or reinforce the buying decision. The trick is not to do it all at once, focusing on just one conversion goal per message, and sending that message at the right time. 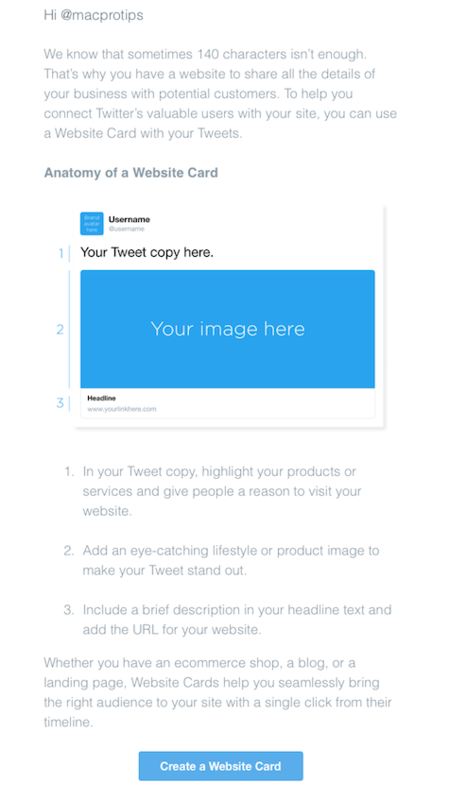 For instance, Twitter identifies users who have dabbled with ads and sends them an email to get them to the next level. In this example, they provide some best practices for using their Website Cards feature. Transforming dabblers into devotees is a process. Breaking the Website Cards feature down for the newbie helps make success seem accessible and doable. The call to action takes the user directly to that feature, connecting the dots between the message and the product experience, as well as paving the way from interested user to paying Twitter Ads customer. Imagine how different this email would be if Twitter led with “Ready to promote your tweets?” and threw you into your first ad campaign. That could turn out to be a terrible combination of an uninspiring message leading to an overwhelming or confusing user experience. 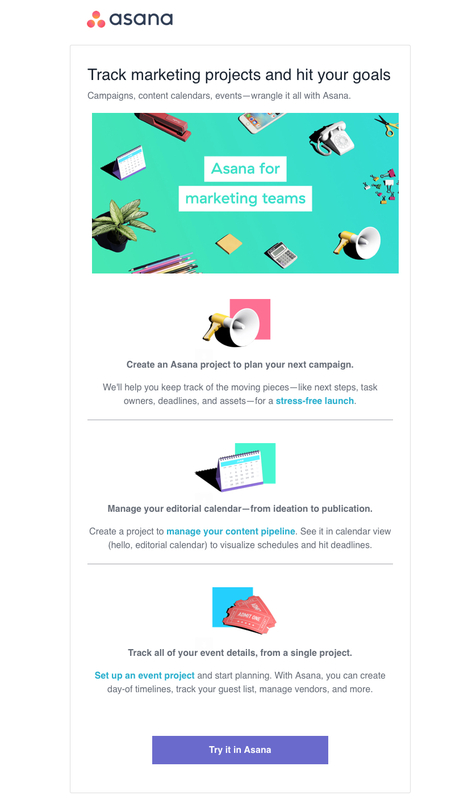 Instead, the subject line reads “@username, see the anatomy of a Website Card,” setting the reader up for an educational experience, not an tonedeaf sales pitch. Contextual follow-up with users who have expressed interest is one of the best ways to keep users active and engaged during this stage. how Pinterest views dormant users in their growth model A new feature or improvement could be just what a dormant user was looking for. While product updates and feature announcements are often batch-and-blast sends to your entire database of contacts, it’s worth trying a more tailored approach. 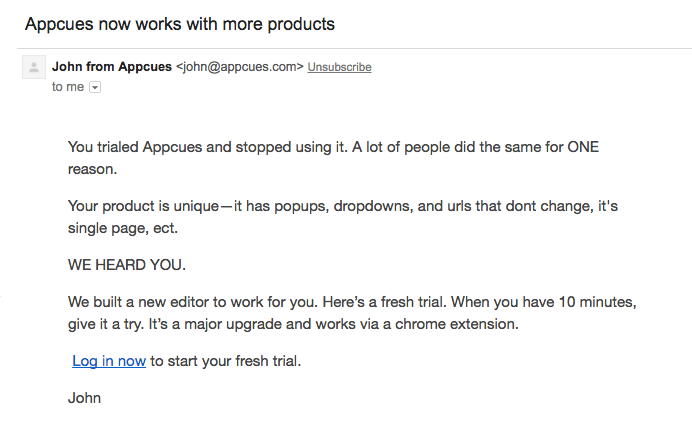 Here’s a no-frills note from Appcues to let former trialers know about a fresh makeover of the product. In a counterintuitive move, this succeeded in gaining my interest because it didn’t look like a shiny promotional message. The simply personalized approach—plaintext style and lack of marketing images or screenshots—and relevant acknowledgment that I’ve tried the product before helps this message hit home. They’re listening to their customers! There was a major upgrade since I left! They’re not beating me over the head by blabbering on about a laundry list of improvements! And it sounds easy to check out (only 10 minutes! chrome extension!). Rekindling the interest of dormant and churned users provides a great, low-risk opportunity for you to try out different persuasion angles beyond the self-centered “we miss you!” message and build a winback machine. Email is one of your best tools to retain users. But like other tools, it’s just a tool. You need to approach your campaigns with a genuine desire to help your users succeed. Once you’re committed to that, the messaging, triggers, design and copy will begin to fall into place. Just a 1% improvement in churn makes a massive difference in your compounding growth. Take retention seriously and your business will reap the rewards for years to come. 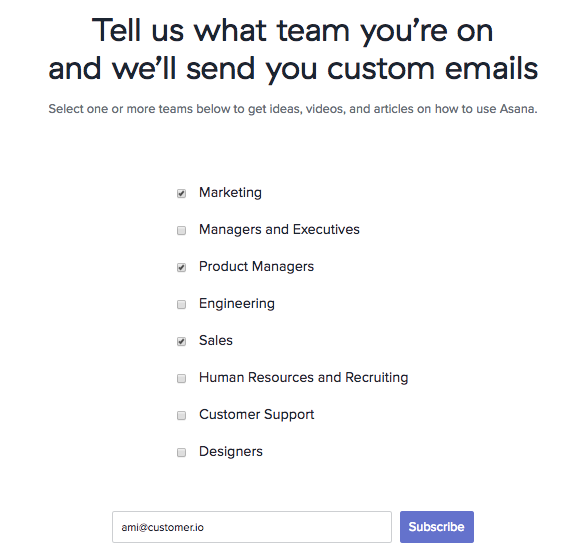 Your turn: Are you sending retention-oriented emails? Why or why not? Share with us in the comments!